Ascend can be integrated with Dexter, which means you can check product availability on Dexter without leaving Ascend. 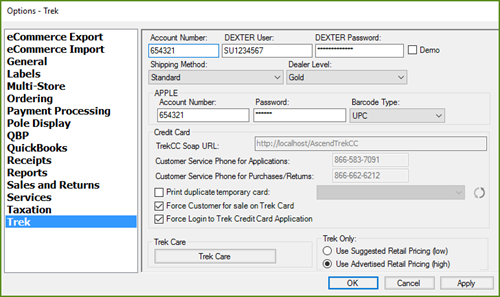 To integrate with Trek, you need to provide Ascend with your dexdealer login information in a couple places of Ascend. You can also select your Dealer Level here using the dropdown menu below the DEXTER information, or set your retail pricing (Suggested or Advertised) in the lower right. Next, select View > Vendors from the Ascend desktop. Double-click the Trek Bicycle Corportation vendor to edit it (or create the vendor, if needed). 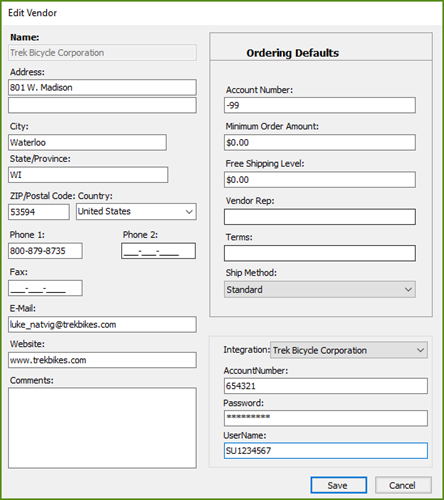 and DEXTER User name (use your shops' super user account information). One advantage of integration is that you can check product availability in Ascend when you're creating your vendor orders. After you've added all the products you plan to order to the Vendor Order screen, simply click the Avail icon to check availability on Dexter. The in-stock columns display warehouse quantities in the order of Primary - Secondary - Tertiary. If a product displays in purple text, scroll to view the Dexter message column for that product. 1. Select the Submit icon. 2. Select Yes on the prompt to save the order. 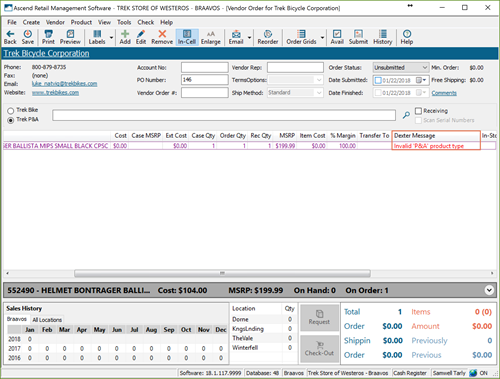 3.Update the Trek order review screen, if needed. You may need to select your shipping method or add a note for your rep.
4. Select Submit at the bottom of the screen.